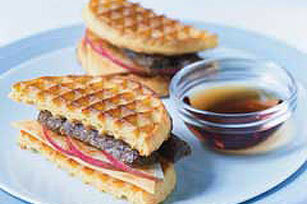 Start your day off with this Easy Toaster Waffle Sandwich. This Easy Toaster Waffle Sandwich includes crunchy apple slices and BOCA Veggie Breakfast Links. Toast waffles. Meanwhile, microwave breakfast links as directed on package. Cut links lengthwise in half. Fill waffles with 2% Milk Singles, apples, cinnamon sugar and breakfast links; cut in half. For more flavor, add thin red onion slice to sandwich filling.